Whether you’re local to Saskatchewan or just passing through, it would be a shame to miss out on the bustling legal cannabis scene that’s growing throughout the province. To make it easy on you, we put together a list of eight cannabis dispensaries in Saskatchewan you must visit. From beautiful physical stores with friendly staff to easy online delivery, there’s a convenient option for every type of cannabis consumer. 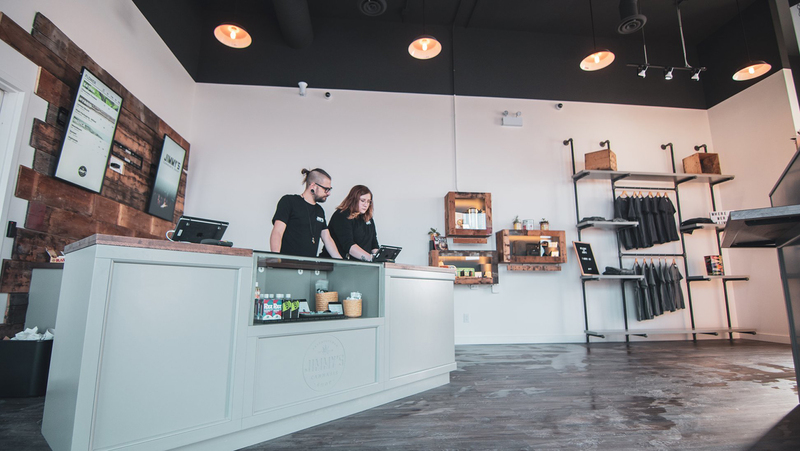 We love seeing locals build successful and beautiful cannabis retail stores in Saskatchewan. And Lush Leaf Cannabis is the perfect embodiment of local roots. Owned and operated by a local couple, Lush Leaf is dedicated to their family and community-oriented business ethos. The red-and-white tile floor at Lush Leaf reminds us of a funky 1950s diner, but their dispensary is far from retro. Outfitted with smart technologies to make the sales process smoother than ever, Lush Leaf offers an incredibly easy and educational in-store sales experience. And if you’re too busy to stop into their Esterhazy store, you can order through their online store and have your cannabis shipped to anywhere in the province! Cannabis Co. YQR, located on the fringe of the warehouse district in Regina, was the first legal shop to open in the area. 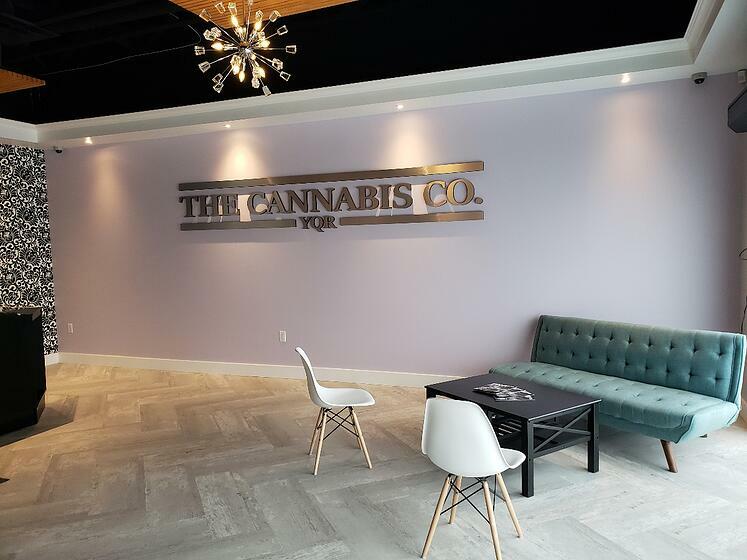 Unlike many dispensaries, the owner of Cannabis Co. steered clear of the traditional green and black color scheme that’s all too prevalent at retail cannabis stores. The result: A beautiful store with pale lavender walls and sophisticated black-and-white wallpaper accents, making it look like an upscale boutique your mother would be comfortable perusing. Shopping at Cannabis Co. YQR means you’re also boosting a local, woman-led business! Tweed is typically associated with the jackets of old college professors. But in this case, Tweed is far from stiff and boring! 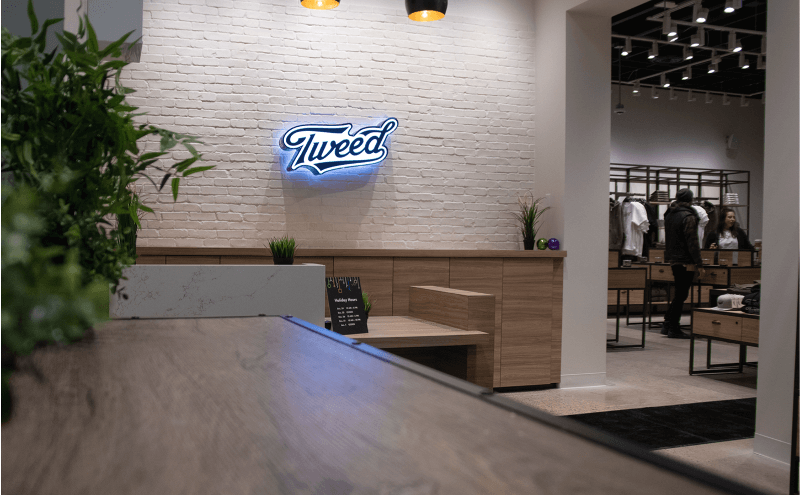 Tweed is a cannabis collective with locations throughout Canada, including Saskatchewan. Their stores boast a clean, modern design with large wood-and-glass display cases showing off their impressive selection of cannabis flower, concentrates, glass goods, and more. We love their attention to detail when it comes to sustainability. Tweed partners with TerraCycle to provide customers with an outlet where they can recycle their packaging, from their plastic bottles and lids, to pre-rolled joint containers, and bags. Customers can bring in their empty packaging and drop it the TerraCycle box in the store. In addition, Tweed is committed to investing more than $20 million over the next four years into ideas that “energize neighborhoods, feed culture, and leave a lasting impact on Canadian communities.” Now that’s something we can get behind! If you’re in Swift Current, Saskatchewan and looking for a local cannabis business to support, Dreamweaver’s Cannabis is the shop for you. You can find this locally-owned and operated retail shop on a charming street in the center of town. The entire sales floor is lined with huge glass display cases and floor-to-ceiling glass shelving behind the sales counter. Their displays are filled with an impressive selection of cannabis product and glass accessories from big brands like Grav Labs -- a selection to impress even the pickiest of cannabis connoisseurs. Jimmy’s Cannabis is the sole retail cannabis license holder in Battleford, Estevan, Martensville, and Moosomin, but their online store and delivery option services all of Saskatchewan. Jimmy’s simple and beautiful stores mix cold concrete and metal with rich browns and wood to create a warm, yet modern shopping experience. Big digital menus are on display behind the counter, an updated touch that makes it easy for customers to know what’s in stock. Shopping here feels like walking into your favorite coffee shop with baristas that know you by name and already have your order ready. Fire & Flower is a leading retail cannabis chain with stores in multiple provinces, Saskatchewan included. 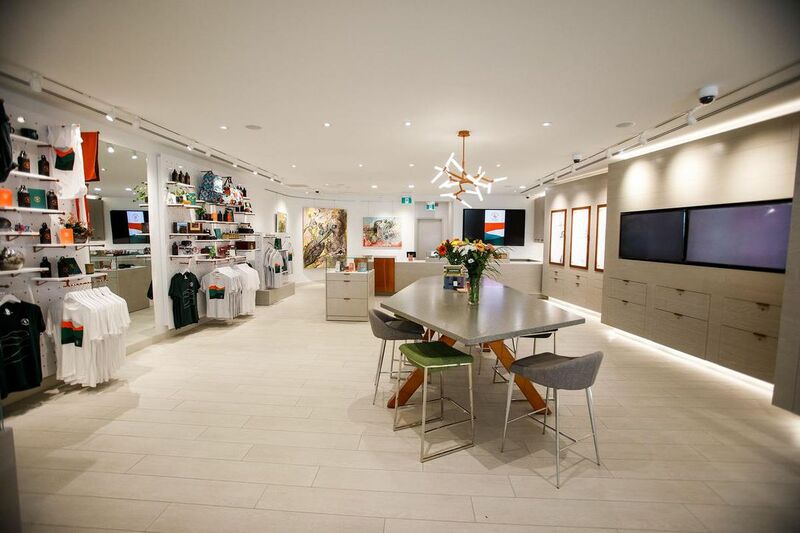 Their stores offer a textbook example of how to do dispensary design in Canada right. Their bright white, sleek design pops with loud accent colors throughout. From the art on the walls, to their art deco-inspired lighting fixtures, sniffing stations, and digital menus, they get an A+ across the board. Because Fire & Flower is one of the larger cannabis retailers in Canada, they offer a huge selection of some of Canada’s top brands. At the Fire & Flower in Fort Saskatchewan, North Battleford, and Yorkton, you can find some of the most popular cannabis products from Leafs by Snoop, San Rafael, Broken Coast, DNA Genetics, and more. It’s hard to miss Eden Cannabis Co. in Regina. Their bright purple doors immediately bring attention to their storefront and the vibrant colors keep coming once you step inside. 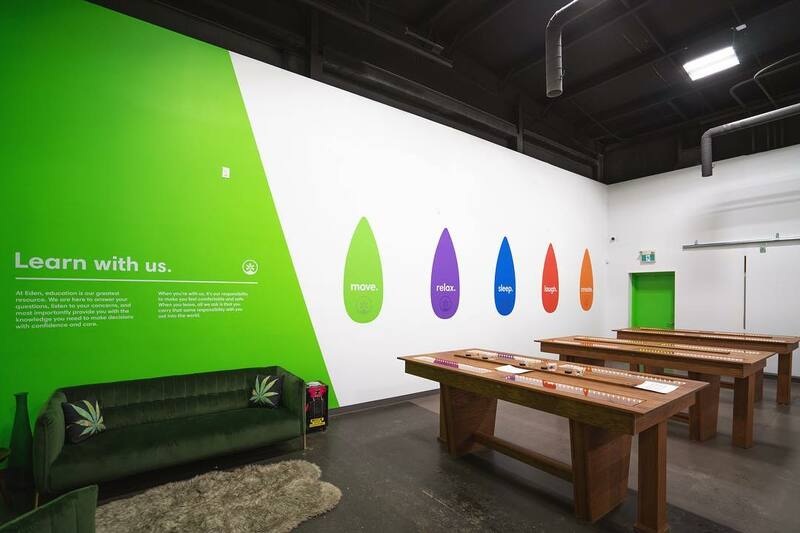 We love how they guide customers through their shopping experience with big, bright wall decals describing the expected effects of different cannabis strains with descriptive words like “move,” “sleep,” “relax,” “laugh,” and “create”. 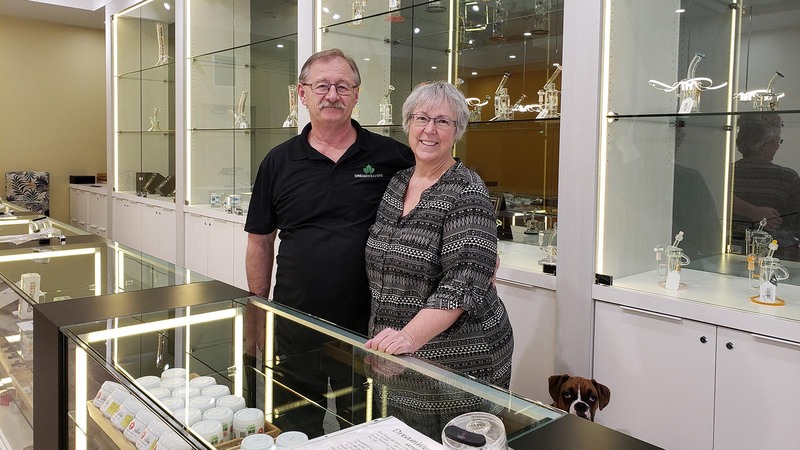 They display samples of cannabis flower in clear containers with magnifying glasses and sniffing vents so customers know exactly what they’re about to purchase. If you can’t make it into the store, they have an online shopping option that delivers anywhere in Regina and surrounding areas. If you order by noon, you get guaranteed same-day delivery and orders over $99 get free delivery. How easy is that? Even though Spiritleaf is a multi-province franchise, many of their locations are owned and operated by people in the local community. And that includes their shop in Saskatoon! So you can shop here knowing you are supporting your local community, but you’ll have the benefit of a large retailer’s product selection. 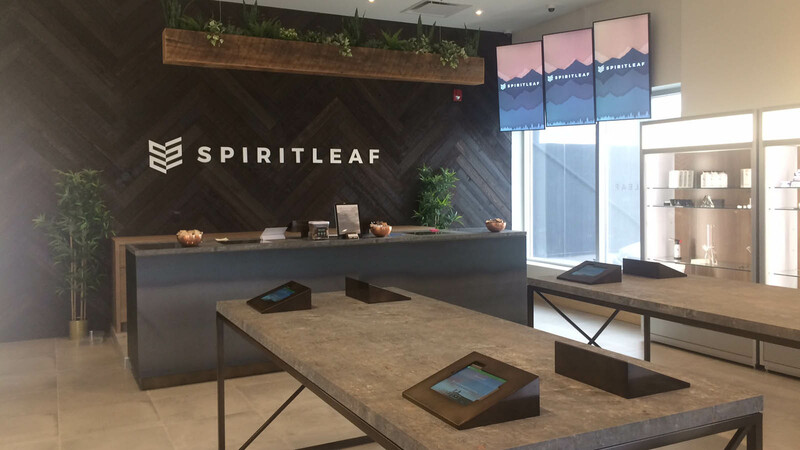 Each Spiritleaf location is beautiful, but we’re big fans of the dark wood paneling, rich brown furniture, and modern glass display cases at the Saskatchewan store. Swipe through their inventory with ease by utilizing the tablet menus available throughout the store. If you can’t tell already, we love nerding out over dispensary design, retail cannabis best practices, and tips for running a smooth cannabis operation. Subscribe to our blog to stay up-to-date on all of those things and more!